The federal government has banned cathode ray tubes (CRTs) from landfill disposal. 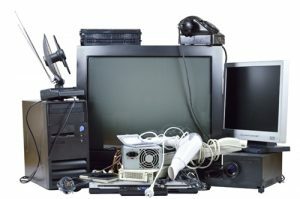 As these are most commonly, but not always, found in old televisions, the agency offers a recycling program for all high-tech electronic wastes like televisions, computer monitors, printers, and accessories. Items like VCRs, fax machines, and cell phones are also part of the program. Many, though not all, of these items are accepted at no charge.